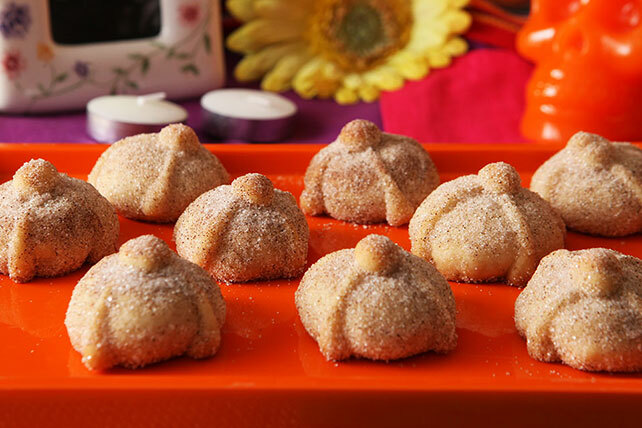 Our Shortbread Day of the Dead Cookies are modeled after traditional pan de muertos. Shortbread Day of the Dead Cookies are a perfect, sweet way to celebrate this important holiday. Share a plate of Shortbread Day of the Dead cookies with your family, and get in on the fun. Combine 2 cups flour and baking soda. Beat cream cheese, butter, powdered sugar and vanilla in large bowl with mixer until light and fluffy. Gradually add flour mixture, mixing well after each addition. Reserve 1/3 cup dough. Shape remaining dough into 42 (1-inch balls); place, 2 inches apart, on baking sheets. Mix reserved dough with remaining flour; divide into 42 small pieces, using about 1/4 tsp. for each. Divide each piece into thirds; roll 1 piece into ball, then roll each of the remaining 2 pieces into 2-inch-long strip. Place 2 strips in "x" shape on top of each dough ball on baking sheets. Add small ball of dough to center of each "x." Bake 20 min. or until bottoms of cookies are lightly browned. Meanwhile, combine granulated sugar and cinnamon in medium bowl. Roll warm cookies, 1 at a time, in cinnamon mixture until evenly coated; place on wire racks. Cool completely. You'll know it's a special occasion when you get to enjoy a serving of these delicious cookies. This cookie dough can be prepared in advance. Refrigerate up to 1 week ahead before using as directed. Day of the Dead is celebrated across Mexico with multiple celebrations throughout the day. Serving "Day of the Dead Bread" is a must on this day. These delicious buttery cookies resemble "pan de muerto" or the "bread of the dead."